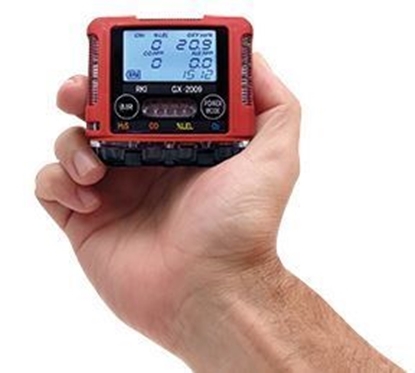 RKI is proud to offer the smallest and lightest 4-gas monitor in the world, the GX-2009. Weighing only 4.6 ounces, it fits in the palm of your hand (2.75” H x 2.95” L x .98” D). The GX-2009 simultaneously monitors and displays combustibles, oxygen, carbon monoxide, and hydrogen sulfide. The GX-2009 represents the latest evolution of gas detection technology. Advancements include dual audible alarm ports and alarm LED’s on 3 sides of the instrument, so that alarm conditions are obvious from multiple perspectives especially in high noise environments. Other features include a water resistant and dustproof design with IP 67 rating, an impact resistant rubber over-mold body that is RFI resistant, and a large capacity data logging system included as standard. Other standard features are vibration alarm, auto-calibration, calibration and bump test lock out or reminder control, STEL / TWA readings, peak hold, auto backlighting at alarm on a large LCD display, and it even tells the time! All of these controls and features are operated through 2 simple glow-in-the dark, glove friendly buttons. The NiMH battery set will operate for 20 hours and will fully charge in 3 hours. A huge capacity data logging function is a standard feature on all GX-2009 instruments. The data logging software will store up to 100 calibration records and is Windows 7, XP, and Vista compatible. The GX-2009 is also functional with the Data Cal 2000 instrument maintenance system and the SM-2009U single calibration station. 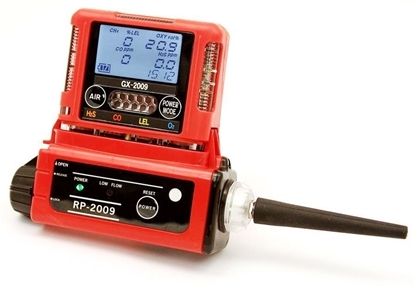 The GX-2009 is designed around RKI’s compact and proven sensors, utilizing catalytic combustion, electrochemical and galvanic sensor technologies. Each miniaturized sensor is manufactured with the same high quality control that has made RKI sensors and instruments the most reliable and long lasting monitoring devices in the industry. Instrument Price Includes 13-0112RK Wrist strap 71-8002RK Product CD, GX-2009, includes Product Training, Parts List, Data Logging Program, User Setup Program, Operators Manual, Quick Reference Card, and alligator clip.